Dimensions: 44.5 x 31.8 x 5.6mm (1.75 x 1.25 x 0.22") (L x W x Th). Maximum input voltage: 18 volts. Output voltage: 6 to 36 volts. This DC/DC Voltage converter circuit will step up (boost) an input voltage to the selected output voltage. 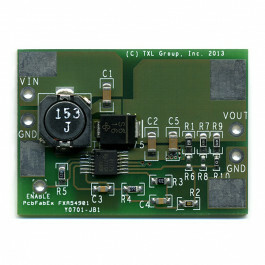 DC-DC converter used to boost the low voltage outputs from many thermoelectric applications into higher, more usable voltages. Converts up to 8 watts. Default jumper set to 24.0 volts. Can easily be moved with small tip soldering iron. Ready for you to attach lead wires (not included) on both input and ouput. Developed in cooperation with TXL Group, a leading manufacturer of thermoelectric solutions for capturing waste heat energy.